1. Let's start with something already mentioned, no annoying and uninvited pests! Florida is notorious for swarms of mosquitoes and the dreaded lovebugs, but with a screen installed throughout the patio, this means they can't get in! This also means you can spend more time in your screened in outdoor area, not having to pack it all inside when the sun starts to set. Enjoy a drink on the patio without having to worry if there's a bug floating in it. 2. You can transform the room that's screened in! By adding screens to the open parts of a porch, patio, or any outdoor area and then adding simple furniture - you could add a basic extension to a living room or even the kitchen. This can be done by adding a dining table and chairs, or even outdoor friendly lounge chairs. 3. Keeps your business private. Screens have transparency, but they also provide owners with more privacy than a bare open patio space. It also adds more shade on a sunny day while still letting in that fresh air, though thankfully not as hot on the inside of the screened in patio. 4. Spring, Summer, Winter, Fall, doesn't matter because screens can weather them all! That's one of the best things about screening in a porch or patio is its versatility with every season of the year. And depending on the type of procedures needing to be taken during the time, screening even holds up in severe weather. 5. And the best reason to get a screened in porch, that energy saving airflow is FREE! Instead of staying inside with a fan or air conditioner running constantly, shut them off and step outside! Bring a book, a charged phone or laptop, some snacks, or even just your thoughts and take some time to breathe in that fresh air and enjoy a possible breeze. Or lock your screen doors and leave your main door open, let it circulate through your home. If you have a wide open porch or patio that you wish you could enjoy, even more, don't hesitate to take that next step to screen it in. Enjoy your home for all it's worth, even the outside of it. 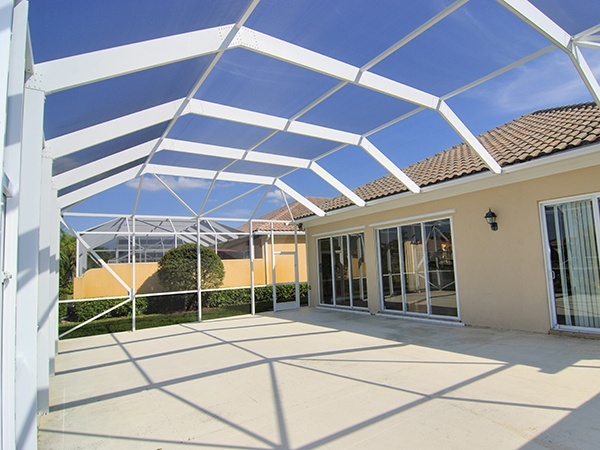 Quality Screens and Aluminum can help you get the perfect screened in patio that you have been dreaming of. Contact our team today to get started.